Mr Johnson agreed to lend £10m for three years to owners Patisserie Holdings plc, which the company said would provide “immediate liquidity”. The cafe chain has been fighting for survival after revealing on Wednesday it had uncovered “significant, and potentially fraudulent, accounting irregularities”. The Serious Fraud Office said it had “opened a criminal investigation into an individual”. “We can give no further information or comment at this time,” the SFO said, without naming the individual. Patisserie Valerie’s shares were trading at 429p before they were suspended on Wednesday. It has five brands: Patisserie Valerie, Druckers – Vienna Patisserie, Philpotts, Baker & Spice and Flour Power City. Now, there are 206 stores across the chain and more than 2,500 staff as of May 2018. 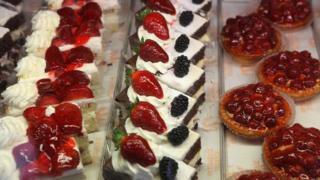 The first Patisserie Valerie café was opened on Frith Street in London’s Soho district in 1926. In 1987 the Scalzo family bought the Old Compton Street store and ran the business. Mr Johnson, who invested in Patisserie Valerie in 2006, is a serial entrepreneur who is best known for taking control of Pizza Express in 1993 before selling out in 1999. In 2001 he co-founded Risk Capital Partners, which owns stakes in companies including Majestic Bingo and swimming goods firm Zoggs. Patisserie Holding’s directors said in a statement that once the share issue and loans had taken effect, the company would be able to continue trading in its present form “for the foreseeable future”. “Following the initial investigation, the directors can confirm that the group has net debt of approximately £9.8m,” the statement said. However, it added that shareholders should be aware that investigations into the company’s “financial irregularities” were at “a very preliminary stage”. The statement also said that the irregularities were also likely to have affected the historical financial statements of the company. In its most recent results statement in May, the firm said it had cash reserves of £28.8m.